Recently a rheumatologist friend told me of needing to prove ACR20 (a measure of 20 percent improvement) in order for a patient to continue receiving a biologic treatment. I don’t know whether it was private or government insurance, but something bothered me about it. Measuring beyond synovitis? And beyond joints? Attention is not given to symptoms beyond joints – or often beyond synovitis (inflamed synovial tissue). What if a person’s joint symptoms did not improve enough, but his lung symptoms did? I know a person like this whose rheumatoid lung disease was brought under control by methotrexate, while joint symptoms continued. Of course the opposite scenario is equally troublesome, and probably more common: a person’s synovitis improving, with little or no attention paid to non-articular aspects of the disease. Some patients receive medical attention for extra-articular (outside of joint) symptoms of rheumatoid disease and many do not. Either way, I’ve never heard of including them in a measure of disease activity. And that makes sense because those symptoms are not tracked or treated by rheumatologists. Rheumatologists are trained to identify and evaluate rheumatic diseases by musculoskeletal symptoms (although there are often discrepancies there as well). Last year, I read the story of Sandy Blue on Mayo Clinic’s blog. 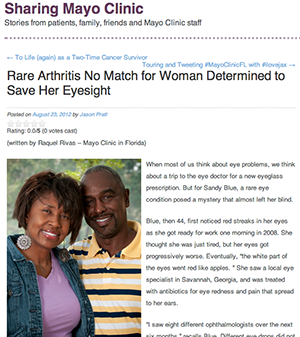 Of course it’s impossible to have joint inflammation (“arthritis”) in the eyes since there are no joints in the eyes. Sandy saw eight eye specialists over six months before finally traveling to Mayo Clinic where a “team approach” allowed her to be diagnosed with Rheumatoid Arthritis. Sandy’s first apparent symptom of RA was her scleritis, which inflamed her eyes so badly she could not see. If you work in the healthcare industry, especially if you’re a clinician who treats people with Rheumatoid, I hope you’ll take advantage of the 558 comments on that article. While it would be impossible to determine a frequency of occurrence of each initial symptom, the list does reflect the wide range of symptoms that patients report. I’m not sure I’ve met a patient who experiences only synovitis, but my guess is they are rare. Can a lack of comprehensive grasp of RA harm patients? If you’re a caregiver or patient, questions or difficulties you’ve encountered in treating this disease are usually related to this problem – including a need for more effective drugs. How can drug developers find solutions when the problem is so ill defined? Does it matter if symptoms related to the disease are not recorded in the chart of the rheumatologist? In more ways than I can count in one post. What if they’d only treated the kidneys in Dave’s stage IV renal cell carcinoma? We need healthcare professionals to have a clearer more complete understanding of this disease. We need more suitable measurement tools and diagnostic criteria. We need medical care that is more comprehensive in its approach. Of course, adding the patient voice is the way to improve care AND research related to Rheumatoid disease. Whether you’re a patient or provide any kind of care or benefit to Rheumatoid patients, I hope you’ll stand with patients by joining the Rheumatoid Patient Foundation. From 2009: Is There a Typical Rheumatoid Arthritis? “Now I know I’m not crazy” is one of the most common things people write to me in emails. Love this article. My first symptom of RA was trochilitis in my eyes. At the time the eye doc asked if I had RA in the family which I didn’t so we blew it off as a one time occurrence. Unfortunately it came back but I didn’t pursue it till 6 years later when other symptoms became more pronounced. Wish more doctors would try and find the root cause of things instead of treating all the symptoms like they are individual. Would probably help catch things much faster. a lot of my symptoms came and went very rapidly. one day a knee, one day a shoulder, one day a wrist, another day the hands. but what was odd and still not “recognized ” by the rheumys as part of my RA even though it showed up at the exact time of initial onset and it continues to plague me when all else responds well to the medications is my numb feet and toes – peripheral neuopathy. Fortunately I started seeing an opthamologist as soon as I was diagnosed, based on readings online about this disease. 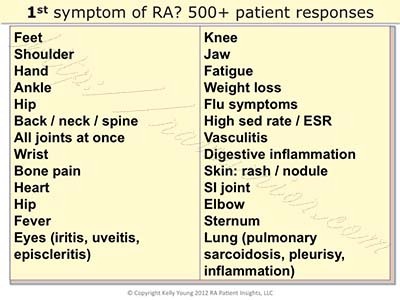 I was lucky my Rheumatologist was bright enough to recognize that I had “Palindromic RA”, as my RA is like Cecilia’s – popping up in one joint for a day, then another, rather than the more traditional “both hands, both knees”, etc. As for the heart and lungs, I get very angry that this is a hidden yet deadly consequence and part of this disease. I had someone actually laugh at me when I told him that I have a benign nodule on my lungs due to RA, and that this can also spread to the heart area, and is a major cause of death in those who have Rheumatoid Arthritis. He told me I had no idea what I was talking about. (no he is not a doctor, does not even have a college degree, but for some reason he figured that since his grandmother had RA, he knew everything about the disease!). AAARRRRGGGHHHH!!! Some of my atypical symptoms not identified at the time, but now in hindsight make more sense…. An unprecedented migrane that lasted for weeks, then went away never to return. The doc couldn’t figure it out, but did say “Your sed rate is off the charts, but that just means you’re sick…. not atypical necessarily, Kelly. I know infertility is common with RA. I can only guess about the migraine – maybe it wasn’t connected. If there is inflammation in the neck joints, I can testify that the headache is hellish. I hope it doesn’t come back! But it’s common for the neck to be affected so let the docs know if you have swelling, pain or other symptoms there. btw, I grew up with a KellyB. 🙂 Kelly Bowen but they called her KellyB. The key is to train primary care practitioners in the symptoms. I had everything but joint pain. There’s no way I would have suspected RA. I had breathing problems, which I now know is rheumatoid lung disease. 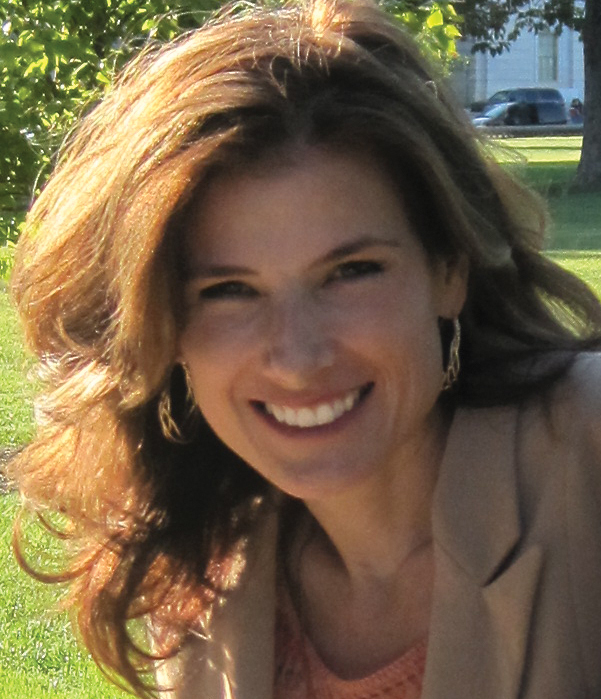 I was first misdiagnosed with asthma and allergies. I had eye inflammation, rashes on arms and chest, cracking and peeling fingertips called machinist hands, etc. My breathing got so severe and then finally my joints started swelling and I couldn’t stand up on my own. I told my husband to just take me to the ER. I had been to general practitioners, allergy specialist, and dermatologist. The pulmonalogist at the hospital saw the damage to my lungs and told me he suspected an autoimmune disorder and referred me to a rheumatologist. Then I was finally diagnosed after about two years of progressively getting worse. If I had been correctly diagnosed earlier, I could have began appropriate treatment and probably wouldn’t have the severe lung damage. General practitioners should be able to recognize symptoms other than joint problems and test for it or at least know to refer you to a rheumatologist. 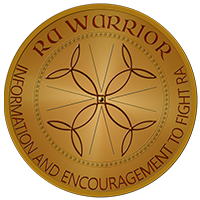 I was very ignorant about RA symptoms myself but have learned so much since my diagnosis. If anyone complains to me about such symptoms, I tell them my story and to consider getting it ruled out. thank you for sharing, Mary. I agree we do need to educate all kinds of doctors about what rheumatoid can be like. That’s why the woman in the story (Sandy) had such a hard time being diagnosed. After 14 years of RA (on metho the whole time), I added Enbrel 4 months ago. Now out of nowhere, Reynauds surfaces. Could it be from the Enbrel? Thought it odd that it would not appear through those first 14 years. Another person I talked to who had RA and Raynaud’s got the Raynaud’s for the first time 20 years after her diagnosis and she wasn’t doing biologics. I had Raynaud’s before I was diagnosed with the RA and now I wonder if it was actually the first symptom. The beginning of my life with Juvenile Rheumatoid Arthritis began with the “normal” symptoms: joint inflammation, redness, and joint hotness. Fever, on-and-off rash, feeling constantly flu-y, and exhausted. It also was the beginning of my development of obstructive sleep apnea. It is VERY common for people with (J)RA to have swollen lymph nodes (I still get them). For me, my tonsils and adenoids got so swollen that they blocked the air passage and prevented me from breathing in my sleep. Obstructive sleep apnea from tonsil swelling is very common for RA patients, but still, it took YEARS to get a sleep apnea diagnosis and tonsillectomy, because my fatigue must simply be a result of my undiagnosed-though-still-clearly-a-type-of-autoimmune-arthritis condition. Despite being diagnosed originally with JRA at 9, they retracted my diagnosis until I was 16 and had had a biopsy (though I was going to also have a synovectomy at the same time as the biopsy until they went on and were shocked to not see what they were expecting). Noting the lymph node involvement could have definitely helped re-gain my diagnosis sooner. 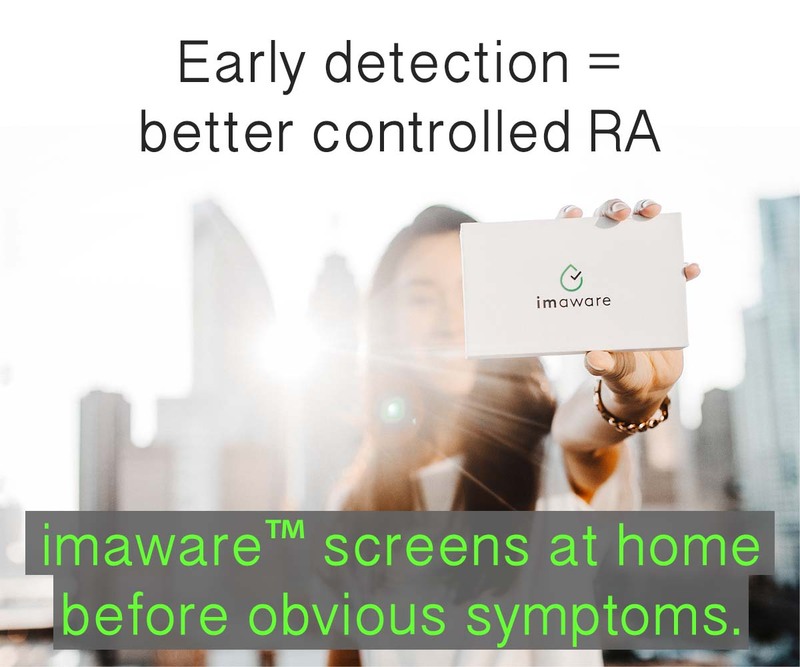 RA is a SYSTEMIC AUTOIMMUNE disease. I think it is very important for health care professionals to start noting non-joint symptoms as an inevitability for untreated or undertreated individuals. I also think that noting and examining the lymph node swelling in relation to autoimmunity is important. Thank you for posting Rebecca. Those are helpful points for the discussion. My hips have become a BIG problem for me. My doc said that RA doesn’t usually effect the hips and that it is probably secondary Fibromyalgia causing my hip pain. I trust her- but my hip pain is SO bad, and it doesn’t seem like the typical flu-y achey fibro pain that I get. To me, it feels closer to the knee/wrist/hand/ankle etc joint pain that I get from the arthritis. Have any of you had hip pain due to RA? Or any thoughts?? I’m getting a little worried about it because if it isn’t RA and the meds aren’t going to help it, I don’t know what to do about it. It wouldn’t help to train rheumatologists as well. Every symptom that I have had, other than joint pain has been dismissed with a shrug. Recently had salivary gland stones which deformed my face, was extremely painful. When it occurred the first time, I spent several hundred dollars on dental exams and xrays to be told everything looked fine. When it happened a second time, dejavu! Interestingly enough, my vertigo was at it’s worst while my salivary glands were blocked, and I had transient hearing difficulties. For the past year I have suffered with vertigo, and received nothing more than a shrug from doctors on how to get through it. I had a rheumatologist tell me that I couldn’t have sjogren’s because he has seen me cry. I didn’t have the energy to get into the struggle with him about the difference between lubricating tears and emotional tears. I think there needs to be more education in the medical community, and I think that shrugging off the extra-articular symptoms parallels negligence. My first symptoms were severe uveitis leading to glaucoma and eventually needing one eye removed. Preceded my arthritis dx by 5 years. I experienced my first episode of Major Depression six years ago, followed by mania and more depression and so forth. CBC panels became a little off, but doctors signed off on them as they weren’t considered severly abnormal. Other than during mania, I felt like I was made out of lead – even when my mood was in a textbook middle. Vague pains. Primary care chocked it up to medication side effects, even though I and my then-psychiatrist (great guy, moved unfortunately) argued that the medication I was on was not sedating. Fast forward to a year ago, and I start having the “usual” joint pain on both sides. Six months after it started, I see a rheumatologist who says I indeed have something wrong, but it’s mild and can be treated with NSAIDs or steroids only (yeah, give the 20-something girl with Bipolar Disorder steroids for the long-term as first line treatment). I bickered with her until I got a DMARD. I guess the rheumatoid factor is abnormal but not abnormal enough (snort), there’s swelling but not enough (har), of course I can’t open pickle jars now and never could (guitar player for years, martial arts, fix-it type), you gained weight and that’s why you have trouble with your wedding ring (then why is it that I weigh less than I did a year ago but didn’t have trouble with it until all of these joint issues popped up? ), I was probably born with flat feet (actually I had high arches), nine joints and counting (no comment on that), and make sure to take the afternoon off of work in case I get too tired from the methotrexate dose (I can’t work and take care of my kid. I can barely take care of myself. glare). Yep, I did point all of these things out. New primary care offered to refer me somewhere else for a second opinion, and I am supposed to hear back by next week. Current psychiatrist is in his sixties and seems to find this all interesting. Prior to seeing the rheumatologist, he said people died from this disease and death can now often be prevented. Did the medical community forget that people can, did, and do die from this? It baffles me. And a disease that attacks synovium but only in certain places? Does synovium differ that much in chemical composition from hands to the spine to the hips and so forth that the immune system smartly avoids the ones researchers have determined to be avoided? Honestly I don’t know about the synovium thing; I think I’ll look that up sometime. I’m very confused about all of this, and I am happy I found this site. Argh. First time I got that out. It’s very frustrating. Anyway, there are studies here and there on cytokines and mood disorders – cytokines are elevated during mania and depression, though less in depression. Some researchers are investigating how mood disorders and the immune system are connected. Psychiatrist said it might be a chicken/egg scenario – what triggers what. Or who knows. Whatever it is, it makes sense that the brain can be affected. It takes a lot of abuse and is not in a magic bubble where nothing can physically affect it but addictive substances and psychiatric medication like some seem to think. Did I mention I was frustrated? Doubt I’m getting off of the psych meds anytime soon, not that I’d like to, because who knows what actually caused these issues. It could very well be that my vague symptoms were medication-related with a dash of Freudian defense mechanisms. Though I will say it’s weird that pre-joint pain aches are disappearing along with the zombie lead feeling as the methotrexate works it’s magic. And it’s a tad odd that Caucasian American women such as myself and are assertive about health issues unconsciously feel the need to use somatization as a defense mechanism – aren’t Caucasian American women high users of health care because we have less issue with expressing our emotions and health needs compared to our male loved ones? Then again, my teacher in psychoanalysis class looked like he wanted to throttle me when I spoke, so maybe I missed something there. Did I mention I’m frustrated? I’m curious to see if there are any mood changes over time. Still have breakthrough depression once or twice per year. I’m not going to get my hopes up – a life without that sounds almost magical and definitely too good to be true. Wow..you REALLY need to see a different Rheumatologist! My RF was not even abnormal for the first 5 years, and only recently has risen to an “above normal” number. Many people with RA show no abnormality in RF..and my doc also says “positive is positive, regardless of how much positive it is. When I was originally tested, the ANTI CCP number, which was just into the positive zone, is what confirmed to him that my symptoms were part of RA. As for depression – whenever I fall out of remission (its been a bumpy road, much learning going on) I see an accompanying clinical depression set in. Had enough courses in college to recognize it in myself. No, not just being a baby about the pain and the inability to turn the key in my car, this is clinical depression. I also get some of that even while in remission if I am on Vibramycin for more than a couple months. (I alternate months using Minocin and Vibramycin to treat my RA – it works for me, so I am one of the lucky ones that so far for 6 years has been able to avoid the more toxic treatments). I have a bunch of great tools I have purchased to use for opening jars, tabbed cans, etc. Even tho right now my hands and wrists work just fine, I find them handy, and I feel I need to be prepared for whatever may happen as the years go by. I am going to post those tools on my blog today, you may want to check them out. Most available thru Amazon. I hope you are able to find a good rheumatologist who actually knows a bit more about RA. Maybe try the nearest university with a medical school? They often have some of the best Rheumatologists on staff as consultants and speakers. I had just gone to see my rheumatologist and she had asked if I could give a percentage of improvement since I started Enbrel six weeks ago. She told me they like to see at least a 30 percent to keep patients on the medicine. I thought that was very interesting since sometimes it takes so long for those mess to kick in. Then I read this article and thought how do they come up with these numbers! Lol I’m still negative for the RA factor and my SED rate is in the normal range yet there is no doubt I have it and its here to stay so I guess I’m not in the 1.2 million statistic yet. I agree that the term for RA should be changed to Rheumatoid Disease (RD) rather than RA, since many of the afflicted body parts have little to do with common notions of “arthritis”.